The operator station for the 1200A Bunker and Field Rake was designed with comfort and productivity in mind. A large 14-in. 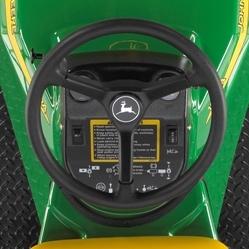 (35.6-cm) diameter steering wheel with 8.3-to-1 gear reduction ratio provides for easy and responsive steering. An adjustable high back seat with spring cushion reduces operator fatigue. Wide running boards offer comfortable leg support across a wide range of operators. All controls for cultivating and front blade operation are conveniently located to the operator's right hand side. The mechanical linkage design allows for easy operation of both attachments. An electrical lift/lower system for the rear-mounted attachments means effortless lifting and lowering. The switch is located on the dash for the ultimate in ease of use. The foot control design of the 1200A increases productivity with ease of operation. 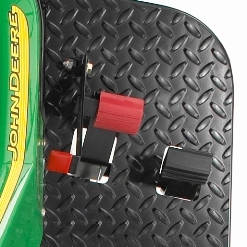 To change from forward to reverse, a convenient pedal system is located on the left side of the foot platform, allowing for quick and easy engagement with the touch of a toe. To select the forward gear, simply press the front pedal forward. To switch to reverse, press the rear foot pedal rearward. Neutral position is required for starting, and can easily be located by utilizing the bar welded to the foot platform. Also located to the left side is the lever for the differential lock. Simply engage by pressing down with the left heel. NOTE: Differential lock should only be activated when the unit is at a complete stop or damage to the transaxle may occur. The brake engagement is located on the right side of the foot platform. A foot-activated transaxle disc brake allows for quick and controlled stops. To activate the parking brake, simply step on the brake pedal and engage the retaining lever. To de-activate the parking brake, simply disengage the retaining lever by pushing forward with the right foot or toe. 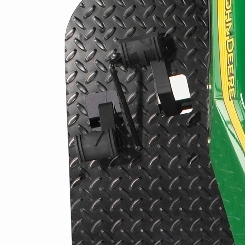 Also located to the right side of the operator platform is the throttle pedal. To move the 1200A, simply select the direction of travel on the left hand side, disengage the parking brake, and press on the throttle pedal. The further the pedal is pushed, the faster you will go. The maximum speed is 12.6 mph (20.3 km/h). NOTE: Revving the engine or failing to brake to a complete stop prior to changing from forward to reverse and vice versa will result in gear clash and may damage the machine. The torque converter and transaxle design delivers a 164-to-1 gear ratio for excellent pulling and pushing power. The belt from torque converter is permanently engaged, greatly reducing the potential of belt wear. A durable Kanzaki® transaxle with a differential lock allows for increased traction and reliability. The rear differential design allows for the 1200A to turn on a tight 12-in. (305-mm) turning radius for outstanding maneuverability, yielding high productivity. Speeds are variable in forward and reverse from 0 mph to 12.6 mph (0 km/h to 20.3 km/h), providing excellent raking quality at reduced ground speeds without sacrificing quick transport from bunker to bunker. Kanzaki is a U.S.-registered trademark of Kanzaki Kokyukoki Manufacturing Company. Raising the hinged rear fiberglass cowling exposes the air-cooled, four-cycle, overhead valve engine. This engine features a powerful 401-cc-cc single-cylinder design, which generates 13.5 hp (10.1 kW)*. *At 3600 rpm. Engine manufacturer gross power tested in accordance with SAE J1995. The engine hp and torque information are provided by the engine manufacturer for comparison purposes only. Actual operating hp and torque will be less. Refer to the engine manufacturer’s website for additional information. Knobby is for increased traction in bunkers, two-ply design. Turf is for reduced marking in turf applications, such as spiking greens. This tread is also an excellent choice for baseball applications, four-ply design. Both tire options feature a 22.5x10-8 front tire and two 25x12-9 rear tires. The 41.5-in. (105.4-cm) wheelbase provides good stability on steep inclines. 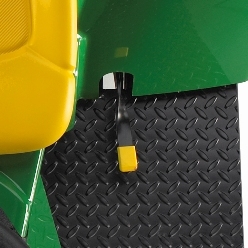 A heavy-duty air filter is standard equipment on the 1200A Bunker and Field Rake. Featuring a cyclone design, this dual element filter can eject 90 percent to 95 percent of dust particles before they reach the paper element core. This reduces overall maintenance costs through less cleaning and replacement. Engine manufacturer gross power tested in accordance with SAE J1995. The engine hp and torque information are provided by the engine manufacturer for comparison purposes only. Actual operating hp and torque will be less. Refer to the engine manufacturer’s website for additional information. For light pushing of sand, gravel, and finish-grade soils. Installs easily to 40-in. (101.6-cm) front blade with one bolt. Made of lightweight, heavy-gauge aluminum. 60-in. (152.4-cm) width exceeds overall machine width for more efficient material movement next to retainer or foundation wall. NOTE: Requires 40-in. (101.6-cm) front blade (9020/BM18537) for attachment. Allows updating machine with rear frame and a rake if desired. The light kit contains a total of three lights, one forward mounted and two rear mounted. It allows for safer operation during early morning and evening hours when daylight is limited. Mid-mounted 64.5-in. (163.8-cm) wide scraper blade--attaches to cultivator equipped with wide or narrow interval scarifier tines. Meets the needs of those desiring level grading or contour-forming capability such as golf course, ball field, and running track construction, renovation, and maintenance. NOTE: Requires mid-mount base (9011/BM18536) and scarifier tines (9012/BM18252 or 9013/BM18253) for attachment. Required to attach mid-mount attachments. Provides more aggressive cultivation and weed control. Wide- or narrow-interval tine sections can be mounted to the mid-mount base (code 9011). Wide-interval tine sections are recommended where surface cultivation and preparation requirements dictate that small rocks (up to 2-1/2-in. (63.5-mm) diameter) must be allowed to pass through the scarifier. Each section includes four 3-1/2-in. (88.9-mm) long carbide tipped tines welded on 3-1/2-in. (88.9-mm) centers. Five sections are required to make up the 20-tine, 63-1/4-in. (160.7-cm) cultivating width. Narrow-interval tine sections are highly recommended for relieving surface compaction on skinned areas of baseball fields, running tacks, and athletic complexes. Also works very well for grooming cinder, crushed brick, and small gravel warning tracks. Each section includes seven 3-1/2-in. (88.9-mm) long carbide tipped tines welded on 1-7/8-in. (47.6-mm) centers. Five sections are required to make up the 35-tine, 62-in. (157.5-cm) cultivating width. 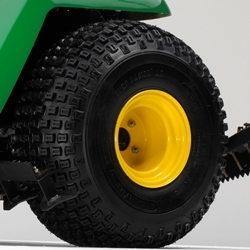 Sports turf tires provide a soft footprint to give less-aggressive tire tread track. Knobby tires are good for general all-around usage. Product features are based on published information at the time of publication. The engine horsepower information is provided by the engine manufacturer to be used for comparison purposes only. Actual operating horsepower will be less. Product features are subject to change without notice. 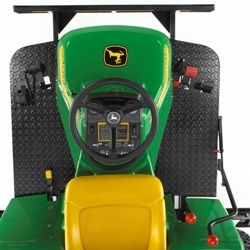 Contact your local John Deere dealer for more detailed information.